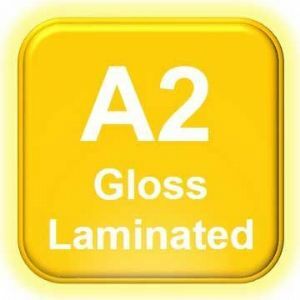 A2 Gloss Encapsulated Poster Printing. Laminated front & back for excellent durability. Colour calibrated posters printed with fade resistant ink. For Gloss Photo Printing, Maps, A-boards, Outdoor Use, perfect for use with dry wipe markers. Great laminated posters - exactly what I wanted and delivered very fast this morning - thank you Chris. I will be sharing your details with other local churches and hope you get new customers. We are about 14 miles from the nearest print service so on-line is the answer for us here!